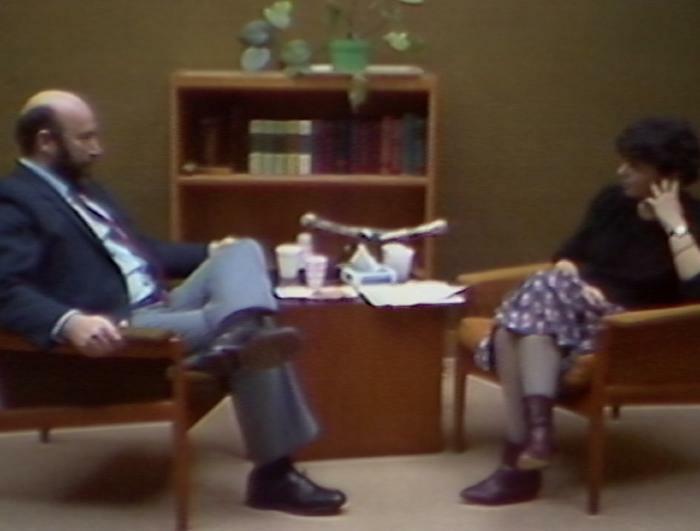 Still image from Bill G. Holocaust testimony, March 21, 1984. SynopsisBill G. was born in Satu Mare, Romania on August 9, 1930. He describes his family. He describes the Jewish community. He recalls attending school and pervasive antisemitism. Bill discusses the Hungarian occupation in 1940 and increased anti-Jewish regulations. He recalls his parents’ false sense of security. He recalls how his older brother was sent to Budapest. He describes German occupation in 1944 and ghettoization. He describes deportation with his parents and interactions with German guards during a stop in Košice, Slovakia. Bill recalls arrival at Birkenau and separation from family. He describes his initial emotional reaction and receiving help from prisoners. He discusses making psyschological adjustments. He describes being separated into a youth barrack in Auschwitz. He describes transfer to Mühldorf and the conditions. He describes helping other prisoners and receiving assistance from prisoners and guards. He describes evacuation by train and an escape attempt. He recalls liberation by United States troops and receiving Red Cross assistance. Bill describes reuniting with his father and learning how his brother and sister also survived. He describes returning to Satu Mare. He recalls travelling to Germany with assistance of Beriḥah. He describes signing up for a children’s transport sponsored by the Canadian Jewish Congress. He discusses his education and work in Canada. He describes his marriage and family. He discusses sharing his experience. Bill discusses how important luck and intuition were to his survival. He shows artefacts that are discussed throughout the interview.